Friends Rides Antique and vintage Harley Davidsons. Pictures from Ciccalone's funeral, We lost a good friend and Henderson restoration expert. at the funeral, we found many other intrests that Steve had, including Model A enthusiasts, College friends recounting football records Steve set and still holds, Steve was also a traveling Marine inspector certifying sea worthieness of cruse ships, as well as merchant vessels. For those of us fortunate enough to know him, he was a lot of fun, and a great man. Steve Ciccalone was a retired Lieutenant Commander in the US Coast Guard. Many of his Former ship-mates came from all over the country to pay their farewell. Al Perry owns the Original Paint Black 1973 Electraglide. Sam Rainal owns the Original Paint 1967 Electraglide Crystal Blue with Birch White tank panels. Brian Golden owns the Anniversary Yellow 1954 Pan. Brian Keating owns the 1947 Knucklehead Original Paint with many bells and whistles. Jim Robertson leaning over the casket saying his final goodbye to our friend Steve Ciccalone "The Commander"
1948 U model Harley Davidson. It has a licence plate/taillight we manufacture and custom dual exhaust. The light is a 49 Chevy Pickup, it also accepts a Model A Ford taillight. Bucks Brothers 1948 U. This is an exhaust we made. This is a 1948 U model somebody started and Buck and I put together for Bucks Brother. It has a licence plate/taillight we manufacture. The light is a 49 Chevy Pickup, it also accepts a Model A Ford taillight. We finally found a good use for the aftemarket fenders, you can cut them up with no guilt. Bob Provencher, I first met Bob hunting for parts at the Keene, NH fleamarket 25 years ago, he was building a 57 FL Panhead. Always smiling here he is on a 47 FL. Bob Frink Photo. Wray Murdough, Second Person I met in the AMCA, Also at Larz Anderson, Here he is on a Bobbed Knuckle long before everybody thought they were cool. Jesse Aikman, now Jesse Lingly, on a 1933 RL taken at Acton Fairgrounds 1985. Bob Frink Photo. Curtis - Bruce Linsday, Another of his rare motorcycles, Photo taken at Perkiomen AMCA Meet. Bob Frink Photo. I used to be a columnist for the Motercyclists Post. The Editor, Bob Frink, took this picture of the late Tom Neil "Torch", Buck, and I on Torches 1949 Panhead with a Goulding Sidecar, The sidecar had the starburst trim. Indian Torque Four Doc Patt Fabricated a clutch and several other parts to make this bike a runner. A vetrenarian by vocation, Doc also worked on B-24s in North Africa and was a Mechanical Genious, and a great guy to have a beer with. This picture taken Acton Maine 1985. Doc was one of the first people I met in the AMCA when I joined in 1976, at the Larz Anderson Museam of transportation. Photo by Bob Frink. Dennis Craig and another of his phenominal Indian Restorations. Every one is better than his last. 1945 Civil Defence Indian Chief, Restored by Danny Vine; Danny has done numerous quality Chief Restorations. Bob Frink Photo. 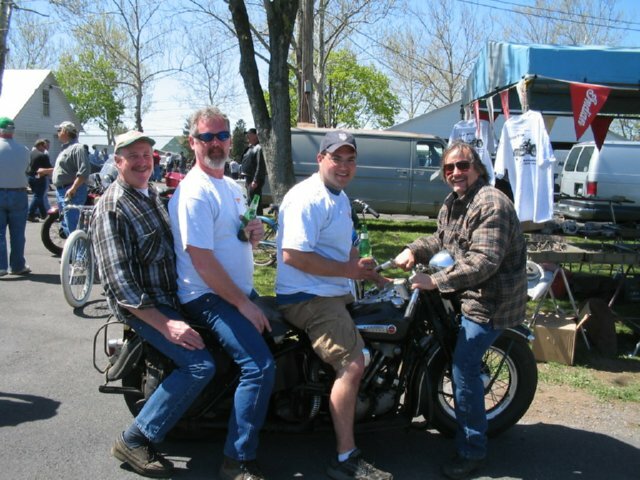 Some of our satisfied customers on a 1930 KJ. Our finishes are very durable as Steve Sam Buck and Denis will attest. Or should this rig be schoolbus yellow? Wrays idea of a custom Bobber. Friend Chris Deluca. Chris owns a body shop in Salsbury Mass. He is into the high performance Asian Bikes. Chris's Brother Dan, frequently riding on one wheel, Dan asked me one day, if I had cruise control on my bike. I looked at him and said cut it out, it's a 1955! Buck and Tucker Oct 06 in Exeter on Swazey Parkway. Andrew LaRoach at Oley, 2006. Andrew again, on a restored 1946. George Tunis on a original paint 1947 FL. Beside him is a grey 1945 EL. Oley 2006. Stevie Barber from the 74 shop Saugerties, NY. Joe Barbers son on a 47 EL at Oley 2006. Knuckel heads on a knuckle, Right to left: Bob Proventure, Stevie, buck and myself.